Can you believe we just got back from doing the perishable xmas shop at Tesco’s and it was pretty busy! We left the house at 1210am, arriving at Tesco shortly after (it is only a short walk away) and found cars in the car park and people already shopping. Tesco opened today at 0001am and there must have people waiting outside to get in. We decided to go at this ungodly hour because a) its just down the road b) we are so not morning people, so going at around 7-8ish was out of the question and we didn’t want to leave it until the afternoon. Whilst waiting for Tesco to open this evening I manage to get Karl’s mum’s bag finished and block my mum’s scarf. I just need to wrap them tomorrow and all the presents are done. So all that is left is planning the christmas dinner. For me, cooking a roast dinner is planned with military precision. I start by deciding what time we will eat, them work back to see what time I need to put the meat in. I then write a timed schedule telling me at what time I need to do each thing. As things are done they are ticked off. Karl has always laughed at this but it worked for my mum (and dad) and work for me. We have a tradition in our house that the hamsters get a Christmas dinner too, we give them a raw sprout, a small piece of carrot and a small piece of turkey. You can now call me insane as all of the above delights will be made by me, no ready made stuff in this house (except the puff pastry I may be mad but no certifiable) and just in case you were unsure of my festive madness I have my family coming over on boxing day so will be making coleslaw, potato salad, houmus, more sausage rolls and cooking a honey glazed ham for them, as well a making some mulled wine for me and my mum. Every year I say I am going to cook less and buy more ready made but I just can’t do it – I love cooking (someone remind of this when I’m swearing in the kitchen over the next 72hours) and much prefer to make my own. I see my festive cooking plans rather like those of a knitter who decides to knit presents for everyone only 10 days before christmas. I occasionally bite off more than I can chew. A couple of years ago I made all this and cakes too, but my stepdad was diagnosed with diabetes this year so have cut out the cakes and stuff. There are plenty of chocolates and sweets about it people want, and I know my mum is bringing some sweet bits with her. For those of you wondering where the mince pies, christmas pud and christmas cake are, well, both me and Karl detest dried fruit, so these things are absent from our celebration. I probably won’t be posting again before christmas, so have a good one everybody and be prepared for lots of photos of christmas food and christmas pressies after boxing day. socks, socks and fave colours. I have completed one of the socks for the KOTR kal. I absolutely loved knitting this sock, and will defintely be making more in the future. The lace is really stretchy which is great as I have wide feet and chunky ankles. I made a slight mishap when transferring from the leg to the foot and the lace doesn’t match up but I know where I have gone wrong and all future socks will be fine. I could have frogged it and all you purists probably think I should have but I see the mistake as evidence of my knitting journey. I will always look at this sock and remember when I couldn’t read lace charts. I have also joined UFO August in an attempt to get the UFO’s I have done and dusted in time for September. I have decided that I WILL NOT cast on another project until these are finished. It is such a great feeling when I have to change the % bar on an item, and even better when it is moved to the FO’s section. I have joined two cool sock kals since last blogging, Sock Wars (sign-ups until 8th Sept) and Mystery Sock Kal (sign-ups til Aug 14th). Sock Wars looks great fun as it involves knitting a pre-determined sock pattern as quick as you can and then posting it to your ‘target’ to ‘kill’ them before you receive a pair socks killing you. Your target then sends you their unfinished socks and their target becomes your new target. Confused? It’s easier than it sounds…go check it out! The great thing is it doesn’t start til Sept 22nd so won’t interfere with my UFO August. Mystery Sock kal, involves finding a sock pattern on the net which doesn’t have a picture with it and then knitting it. It will be great to see what socks turn up. I have a few prospective patterns. I have been busy crafting and shopping for my Fave Colour Swap secret pal, and just have a few finishing touches to the parcel before posting. I am trying to work out how best (and with minimum disruption to my wrapping)to send abroad. I will probably put it all in a nice pretty box, wrapped up etc., then put that into a cardboard box wrapped in brown paper, that way there is quite a bit to get through before the parcel itself it ruined. I don’t want it to arrive looking all tatty. This is the first swap I have been involved with so am quite apprehensive about it. It has been great fun and I can’t wait until they receive the parcel to see if they like it. I am off to London on Wedneday for my annual check-up at the Royal Brompton Hospital. I was really looking forward to visiting Stash Yarns but they are closed that week – just my luck! I do however get to spend the day with Mum, shopping on the King’s Road, having a nice lunch and no doubt buying some yarn in Peter Jones. The Bluebird Epicerie sellMighty Leaf Tea, so I may get some of that, as I am hoping to join the next round of Knitters Tea Swap, so fancy seeing if it is worth the money. If it is nice I can get some more for me and my swap pal mail-order at a later date. I may also have to pop in Lush and get my secret pal something as there are no smellies in their parcel. I have made quite a bit of progress on the Booga bag and just have the i-cord handle to do now. I think I put on a DVD and attempt to get it done. I wonder how soon knitting 6′ of i-cord becomes boring? I’ll tell you next time, the prospect of 6′ is so daunting, i’m only 5’2″, so its almost 1′ more than my height. Oh well no use putting it off. My parcel arrived from Get Knitted today with the extra ball of Debbie Bliss cashmerino I needed to complete my stashbusting scarf and with it was the other yarn I treated myself to. My boyfriend was a bit disappointed as they used to put lollies or sweets in the parcels along with a pen and this time there was a nice smelly candle. He was looking forward to the sweets, I on the other hand appreciated the nice candle. I am going to make another Fan the Flames from this as a Christmas present for my Nan. I thought that the natural colour was a good colour choice as it will show of the lace effect on the ends whilst being neutral. 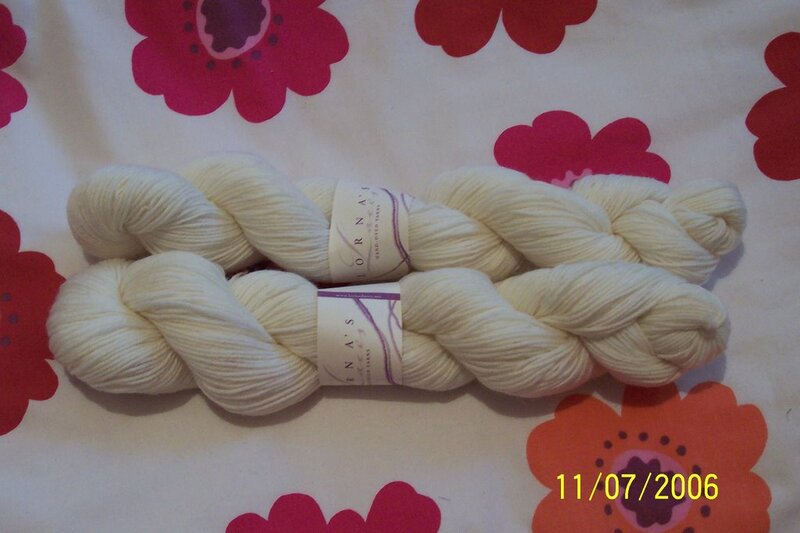 I haven’t ever used this yarn before but know it is very popular. I hope to make some socks out of it soon. 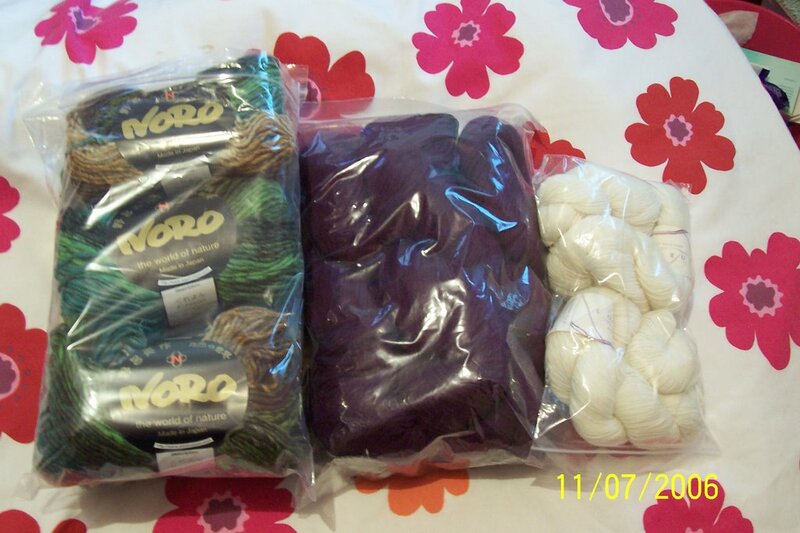 The Noro yarn is going to be used to make a Irish Hiking Scarf, I have got enough yarn to make matching cabled wristwarmers either Tua Cha or Fetching. Noro is a yarn that I have wanted to work with for a while but as so much of it contains mohair (of which I am allergic) I am somewhat limited but the Kureyon is 100% wool. I am very excited about casting on this project but will refrain as will make the plain scarf first. 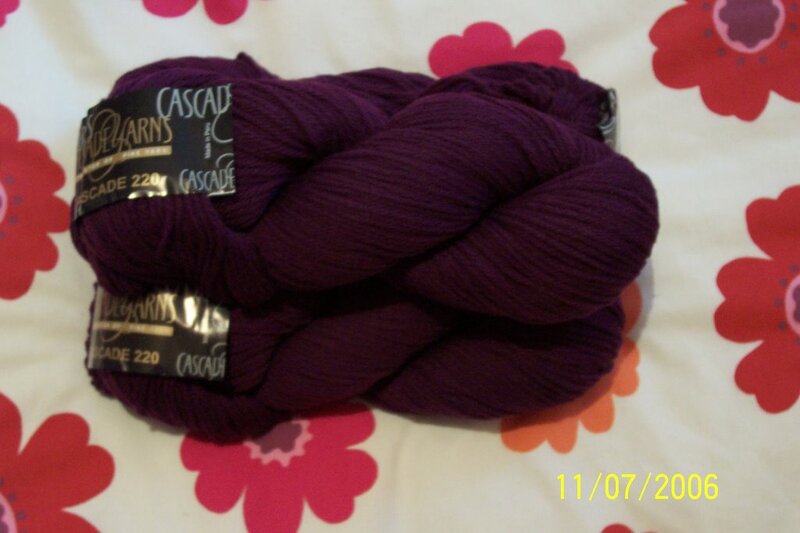 This is the Cascade 220 in a gorgeous deep purple. 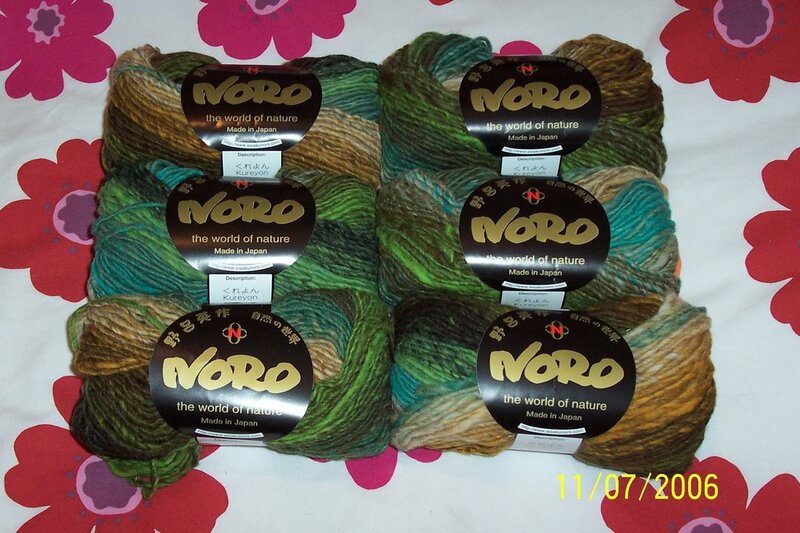 I will use this first to make the IHS,and wristwarmers and then use the Noro for the second one. Both of these will be for me but I am planning to make an IHS, cable wristwarmers and hat for my best friend but am unsure at the moment to which colour to use. If you are beginning to see a pattern in that all my yarn is either green or pink/purple I’m afraid that I absolutely love pink and purple and have many clothes/accessories etc in these colours but also have a lot clothes/accessories in khaki green and brown. I will make an effort to branch away from these colours but can’t promise too much. The Tua Cha wristwarmers are now finished and I am just waiting for the autumn to wear them. I plan on finishing the Fan the Flames scarf in green by the end of the week and casting on the IHS. I may well cast on the voodoo wristwarmers or the maybe a more challenging pair of socks. In the mean time I want to make a pink hairband from some Sirdar Tufty I found lying around especially for the Race for Life and maybe yarn allowing will make some simple wristbands.